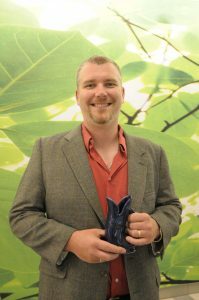 Mount Wachusett Community College Adjunct Instructor Wesley Stanhope holds his Course of Distinction award he received recently for his Renewable Energy Sources course. Mount Wachusett Community College Adjunct Instructor Wesley Stanhope received a Course of Distinction award for his Renewable Energy Sources course at the 12th annual Massachusetts Colleges Online (MCO) E-Learning Conference that was held recently at Greenfield Community College. Stanhope’s class was one of 11 COD winners selected from over 5,000 courses offered through MCO, a consortium built out of the 15 community colleges and nine universities in Massachusetts. The winners were selected for their use of technology to enhance the learning process. Stanhope said a vibrant online course can be created through discussions and sharing of ideas. In addition to receiving the award on June 6, Stanhope presented his course at the conference as part of the Best Practices Showcase. According to MWCC’s Dean of Distance Learning and Instructional Technology Vincent Ialenti, Stanhope uses multiple platforms and VoiceThread technology to provide his students with a vibrant and interactive online learning experience. “You try different ways of gauging how everyone is doing and you try to keep everyone active and collectively engaged together,” said Stanhope who uses VoiceThread to create a slide presentation overlaid with his spoken lecture. Stanhope’s class uses case studies to provide an overview of the costs and benefits of various energy sources and systems. The renewable resources at MWCC’s Gardner campus, which include solar panels and two wind turbines, help make the coursework tangible for students, he said. “You have the wind turbines and everyone sees them from miles around. They generate a lot of electricity for this campus,” said Stanhope. 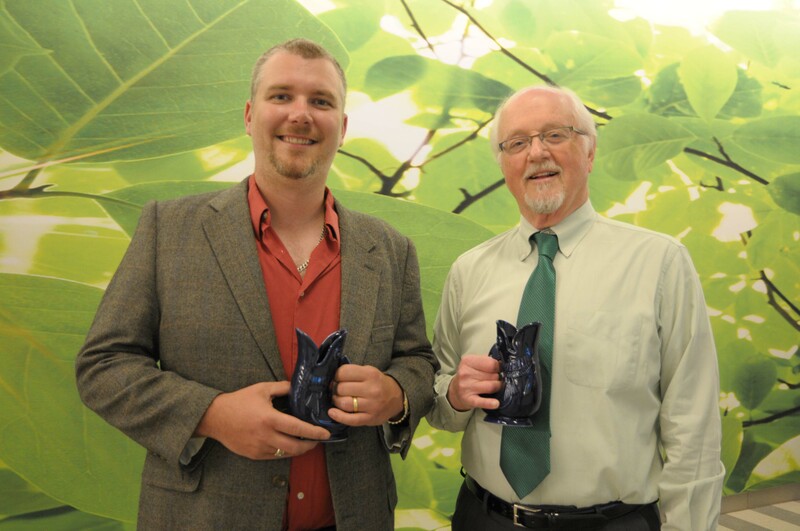 Mount Wachusett Community College Adjunct Instructor Wesley Stanhope and Dean of Distance Learning and Instructional Technology Vincent Ialenti hold awards they recently received at the Massachusetts Colleges Online (MCO) E-Learning Conference that was held recently at Greenfield Community College. Stanhope’s class is one of over 140 online courses offered at MWCC. These courses allow students to learn at their own pace and within their own schedule with 41 percent of all students at the school taking at least one online course during their time at MWCC, said Ialenti. These courses are especially important for students with busy or changing schedules, he said. But advances in technology mean that online students still get an engaging educational experience. “Today’s online courses incorporate technology that enhances teaching and learning beyond the traditional classroom lecture. Stanhope’s course is a good example of this,” said Ialenti. Ialenti was also honored at the conference for his longtime work in the world of online learning and as a founding member of MCO with a Contributor of Distinction for his many years as serving the organization.